You. Me. 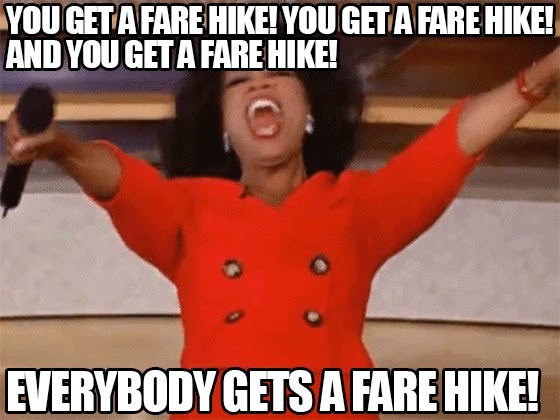 Ride This Crazy Train - Adventures and Observations on The GO: 5% fare increase approved! Wasn't expecting this. Spit coffee. To quote Grumpy Cat, "No". I like how they say they are voting on it. We know it is really a rubber stamp. Today's memorandum (http://www.metrolinx.com/en/docs/pdf/board_agenda/20141211/20141211_BoardMtg_Fare_Increase_EN.pdf), released earlier this week, contained the word "Resolved". What is there to "discuss". Done deal. Rubber stamp, please. Next order of business ... Where's the post-meeting party being held? Pass the bonbons, please. Warren, Board Resolutions much like the pdf you linked to, will always have the word "resolved" in it, although typically, it will say "BE IT RESOLVED THAT" followed by a series of "THAT/AND THAT" statements or "WHEREAS/AND WHEREAS" statements. The occurence of the word "Resolved" does not mean that this was approved before the meeting; in fact, it's a breach of their duties to decide on a matter before the actual meeting. I wouldn't mind so much if the arrival time and service improved a bit. You shouldn't expect improvements in service simply on account of a fare increase. When this institutions state "To serve" they don't mean the general public. They mean they serve the system and their own special interests. It's the same misunderstanding people have of the police and governments. "To protect and to serve" only means they "protect" and "serve" the systems, the overprivileged, and social customs, dogmas, and popular beliefs and prejudices. Their "service" never has anything to do with your rights and entitlements or with meeting your general needs. MATT, thank you for clarifying the word-smithing for me. Now, can we have a show of hands of those in the audience who thought the resolution would not pass, especially after Metrolinx negotiated a four-year 8.45% salary increase with the ATU last June?